It’s Friday, and it’s time for free stuff. This week, we’ve got the sound tools to make your dance tracks hit harder - with a customizable kick and sub-bass, and multisamples of classic FM sounds. Plus, a simple - and very useful - pitch-shifter for Max for Live. Myagi’s FM kick Rack tutorial. Download Myagi’s FM kick Rack and sub bass Rack. The sound designers at AudioBombs have assembled a set of three classic sounds from Yamaha’s TX81Z synthesizer - download them and make a new house classic. While you’re at it, put some extra vintage grit on your sounds with another free Rack from AudioBombs and Certified Trainer Brandon Murphy, emulating the sound of E-MU’s SP1200 sampler. Want even more TX81Z sounds? Try Katsuhiro Chiba’s 1:1 emulator in Max for Live. 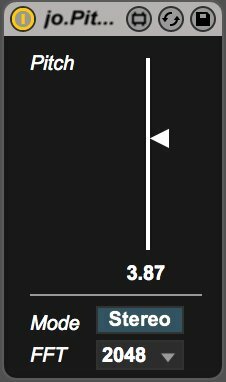 Our last free bit of stuff this week is a simple but very useful Max for Live effect for pitch shifting. With an adjustable FFT size (larger sizes will sound better but require more CPU), and a range of up to two octaves above or below the base pitch, jo.PitchShift is a real-time pitch shifter of more subtle adjustments and radical effects. Creator Jonas Obermüller has more Max for Live effects available for free on his page. That’s it for this week - happy music-making! If you’ve got something to share with us, then please hit us up on Facebook, Twitter, or Google+ - and don’t forget to use #FreeStuffFriday.